It is absolutely wonderful! I have now manifested £10,000.00, which has come to me in such a wonderful and magical way! This is absolutely awesome! I am singing and dancing and jumping for joy! My Cosmic Order for this money has been delivered in perfect time for what I need it for. Yes….my prayers have been answered! I am so grateful for this! I give thanks for the abundance that is mine now, and gratefully accept even more abundance that is being showered upon me now! Thank you, thank you, thank you! This entry was posted in Appreciation, Money on December 17, 2013 by Karen1465. 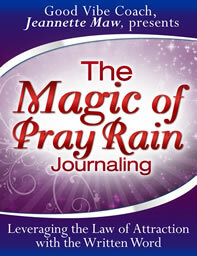 New to Pray Rain Journaling? You'll love the power of this fun and effective manifesting technique! Good Vibe Astrology Where law of attraction meets astrology: learn the language of the Universe with world renowned astrologer Kim Falconer and LOA pro Jeannette Maw. Good Vibe Blog Insightful law of attraction posts and vibe-raising conversations with fellow deliberate creators to harness our power to manifest what we want. Good Vibe Coach Academy Professional law of attraction coach training for coaches. Lisa & Jeannette help coaches incorporate LOA into their client sessions and business practices. Good Vibe Coaching Hire a Good Vibe Certified Coach either as a one time session or for ongoing support to stack the deck in your favor & get LOA savvy skills and experience on your side. Good Vibe University Master the art of manifesting with a community of like minded creators at Good Vibe University. Resources include weekly calls, forums, videos, vibe-lifters & more. LOA Courses Group courses available for new & experienced creators on topics including relationships, financial well being, physical health, professional success, and more. Masters of Creation Jeannette’s private circle for enhanced manifesting support includes private sessions, exclusive forums, group masterminds, video, audio tips & more.